A soil of enlightenment, Gaya is a significant pilgrimage place that is steeped in great history. Equally important for Hindus as well as Buddhist, oodles of folks wish to understand, pursue and gather more information of Buddhism to bring harmony and peacefulness in their lives. This charming site is nestled on the banks of holy River Phalgu in the beautiful state of Bihar. It is a ritual site and renowned for Pind Daan. Hindu devotees from all across the world pay a visit to this consecrated place to carry out Pind Daan pooja for the liberation of the souls of their relatives. Gotten its name from the demon Gayasur, it is certainly a striking city enveloped by temple-crowned mountains. Its great inviolability, magnificent history and splendid appeal make it a must visit destination for any nature lover. Gaya has its mention in the great epics of Ramayana and Mahabharata. Sita, the companion of Lord Rama is deemed to have scourged the Phalgu River of which is a huge stretch of sand dunes. According to the legends, Sita had performed Pind Daan for Rama's father Dasharatha. The story begins with Rama arriving to Gaya along with his brother and consort Sita to carry out the holy rituals for his father, Dasharatha. While the Lord Rama and Lord Lakshman were taking a bath in the sacred water, Goddess Sita was having fun with the sand. Swiftly, Dasharatha emerged of the sand and asked her to perform the Pinda herself. She was asked to make balls of sand instead of waiting for their arrivals for grains. Eventually she offered the Pinda with five bystanders including the Falguni River, a Brahmin, a cow, the Akshaya Vatam and a Tulsi plant. When Rama came back with the ingredients, Goddess Sita narrated a whole story. However, Lord Rama didn't trust it. Thus Sita stood all her witnesses who saw the ritual happening in his absence. All of them took the side of Rama by saying a lie, while the Akshya Vatam acquainted with the reality. Seeing that, she cursed four of them by stating that a cow would never be paid homage from its front, Brahmins of Gaya would never be happy, they would always yearn for food, and no more Tulsi plants would be cultivated at Gaya. Pleased with Akshaya Vatam, she tendered the eternal blessings saying that who arrived at Gaya would do the Pinda daan at the Akshaya Vatam. 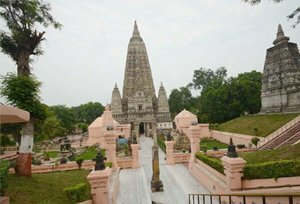 Mahabodhi Temple (Bodh Gaya): Constructed during the 7th century, Mahabodhi Temple is renowned for spiritual significance and is among the popular places of interest for travelers thronging from different parts of the world. It is a Buddhist temple nestled about 60 miles from the beautiful city of Patna. The temple has been refurbished numerous times. Now, it is maintained by Archaeological Survey of India. Vishnupad Temple: Devoted to Lord Vishnu, Vishnupad Temple is positioned on the bank of Phalgu River and has pictures of numerous gods. The temple was erected during 1787 by Queen Ahilyabai and is a must visit for travelers while on a tour to Gaya. Barabar Caves: Perched about 16 miles from Gaya, Barabar Caves date back to the 2nd century and hold a very interesting history. Travelers visiting here can scout the two other caves - Sudama and Chaupar, situated inside the complex having their own significance. Surya Kund: One of the highlights of Gaya, Surya Kund is visited by the tourists during the period of fairs that are held here twice in a year. It is a common faith that a sacred dip in the Kund releases the people of all the sins committed. 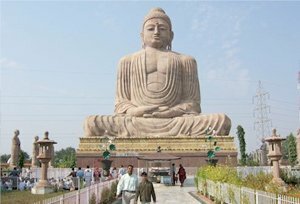 Bodh Gaya: An idyllic place for those who seek comfort, Bodhgaya is known as the most consecrated Buddhist pilgrimage centers located near the Gaya city in the state of Bihar, India. It is steeped in exquisiteness and history making it the highly visited tourist attraction across the country. By Air: The place has its own international airport which is connected to the major cities of India as well foreign countries. Travelers can also reach Gaya by getting down at Patna Airport, around 105 km away. By Rail: The closest railhead is Gaya itself and all the main trains of India goes through this railway station. From there one can take a taxi or a bus to the desired place. By Road: Gaya is well connected with main cities of India by excellent motorable roads. Frequent bus services are easily available from a few cities including Varanasi, Kolkata, Patna, Jamshedpur, Kanpur and many others.